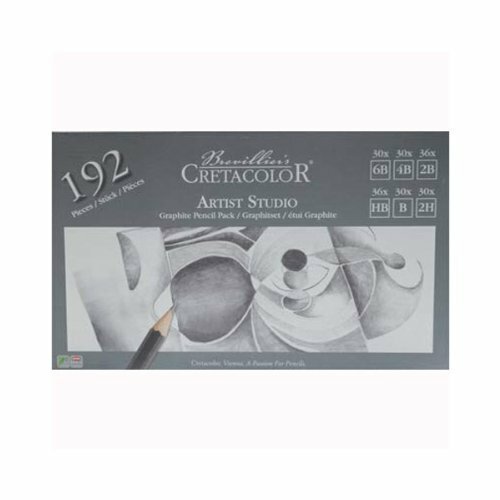 The Artist Studio Graphite Pencil Class Pack of 192 by Cretacolor offers exceptional quality pencils at teacher-friendly prices. This pack has a remarkable value including 192 pencils in 6 hardness grades. Included in the class pack are the following: 30 each of 6B, 4B, B, 2H and 36 each of 2B and HB. Made in Austria with the finest lead quality available, each pack comes in sturdy packaging that will hold up to wear and tear in the classroom. Great for the classroom in college, high school and beyond. Get a full range of light and dark when using these high quality pencils. Cretacolor offers exceptional quality pencils at teacher-friendly prices for classes of art, design, architecture, drawing, technical and engineering students. For 200 years Cretacolor has made the highest quality drawing materials for artists all over the world. Made in Austria. Best Artist quality on market for pencils-comes with 6 different hardness pencils-30 of 6B, 4B, B, and 2H, and 36 each of 2B and HB.